Steven Spielberg sure can be a hit or miss director. Sometimes he proves to be a master of his craft (Jaws, Saving Private Ryan), while other times I have to wonder what on earth he was thinking (Hook, The Lost World). On occasion, he even hits and misses in the same movie. Undeniably enjoyable yet overflowing with cheese, Indiana Jones and The Last Crusade is one of those films. The silliest story of the Indiana Jones Trilogy, The Last Crusade finds the tough as nails archaeologist, Indiana Jones (Harrison Ford), on a quest to find the Holy Grail (yes, the Cup of Christ). 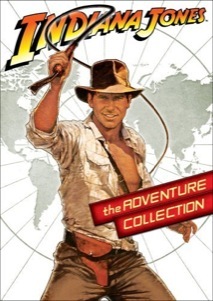 When he discovers that his father, Henry Jones, Sr. (Sean Connery), has disappeared while looking for the sacred artifact, Indy travels from the United States to Italy to Germany while trying to stay one step ahead of the Nazis, who also seek the grail. When the end credits rolled, I was still not certain how I felt about The Last Crusade. I certainly believe it to be a better film than the second installment, Temple of Doom, yet I found that film to be a more enjoyable viewing experience. Crusade benefits from tighter direction and a stronger narrative purpose, yet the story is not as engaging as Temple or anywhere near the caliber of the first film, Raiders of the Lost Ark. While the entire series is anything but plausible, Crusade is more rooted in fantasy than the other installments, an awkward device that sometimes undermines the dramatic intensity of the story. I was amazed to discover that many of the special effects look absurd. The dogfight sequence particularly suffers from dated techniques. While I typically find CGI a nuisance, I must admit that it may have helped this scene significantly. The characters are a mixed bag. On one side we have the cardboard-thin Walter Donovan (Julian Glover), an extremely uninteresting villain whose presence is weakened by a dreadfully stiff performance. On the other side we have Henry Jones Sr., who proves to be the saving grace of the film. Casting Sean Connery as the aging professor was a masterstroke. The suave and debonair style Connery exhibited as James Bond is gone, replaced with a brilliant oxymoronic display of bumbling aplomb. The father-son relationship between Indiana and Henry is a pleasure to observe and significantly boosted my enjoyment of the film. Another standout is the late River Phoenix, who plays young Indiana Jones in the opening sequence. Phoenix demonstrated a keen ability for mimicking Ford's unique facial expressions, a talent that fully convinced me that he was the spitting image of the adventuresome archaeologist. The Last Crusade is the quirkiest in the trilogy, with slapstick humor that succeeds admirably on occasion yet backfires all too often. Thankfully, most of the childish elements that plagued Temple of Doom are absent, but there are nevertheless several truly eye-rolling one-liners. I suppose this is all thanks to Spielberg's fascination with the lighthearted, carefree sense of wonder that was evident in most of his films from the 1980s. Yet, I cannot be too hard on the esteemed director. The Last Crusade still shows Spielberg as a master filmmaker, always capable of injecting his films with a touch of magic. While overall a bit loose, The Last Crusade is a noble effort from a gifted filmmaker and an admirable end to the entertaining Indiana Jones saga. Image Transfer Review: Indiana Jones and the Last Crusade is the most recent entry of this collection, and the improved technology is evident. The 2.35:1 anamorphic widescreen transfer does contain a few surprising defects, but the overall quality is excellent. The interior and nighttime scenes are especially strong, and the desert scenes remain sharp throughout the lengthy chase sequence. Audio Transfer Review: This film includes what is easily the strongest audio offering of this collection. The 5.1-channel Dolby Surround mix provides more complexity than its predecessors and doesn't just blow you out of the room. The surround speakers are used effectively, which creates an exciting presentation throughout the picture. It is clear and subtle when needed, but really cranks up the power to deliver the goods. Extras Review: The Last Crusade improves slightly over the other releases, but it falls into the same trap and just gives us a small group of brief featurettes. The Last Crusade: An Introduction avoids discussing the return to the Raiders of the Lost Ark format that this film represents. That omission is unfortunate, but Spielberg and Lucas do provide a quick look at several important scenes. Indy's Women: The American Film Institute Tribute brings together Karen Allen, Kate Capshaw, and Alison Doody for a conversation about their experiences. The mistake is shortening this segment to only nine minutes and not just including the entire tribute. Only Allen remains overly positive of her experience, which completely makes sense. Capshaw is particularly candid about the beating her character took from feminists and her agreement there was too much screaming. The overall trilogy segment this time is Indy's Friends and Enemies, which quickly covers the memorable characters from the series. This segment easily could have lasted 30 minutes and interviewed the actors involved, but it just scratches the surface. Finally, Storyboards: The Opening Sequence compares the final product to the early drawings of the chase scene aboard the train. This set should have contained numerous featurettes of this type. The remaining supplements include the expected photo galleries and the same video game commercial. It's another mediocre effort that needed a lot more to warrant this DVD release. Indiana Jones and the Last Crusade offers a highly entertaining, light-hearted tale, but the search for the Holy Grail does feel a bit too similar to the first picture. These concerns are mostly alleviated by a wonderful turn by Sean Connery, who�s rarely had more fun on screen. I continue to have reservations about this DVD set, but still can praise this enjoyable movie.